This article appeared in the North Island Gazette on April 24, 2014. Three First Nations tribes were collectively known as the Nahwitti: Tlatlasikwala, Nakomgilisala, and Yutlinuk. There was also a Chief known as Nahwitti, and a place the First Nations referred to as Nahwitti (first a location at Cape Sutil, later a village on Hope Island). The river which we now know as the Nahwitti was originally known to the First Nations as “wuda staade” (having cold water). In 1786 James Strange and Alexander Walker visited the area on the ship Captain Cook. They saw signs of local villages but did not encounter any of the local First Nations. In 1792 Don Galiano traded with the Nahwitti and left a large number of trade beads with the local people as a gift and gesture of goodwill. These brown beads are unique and can still be found in the possession of local families. Also in 1792 John Boit, on-board the Columbia, visited the area and attempted to trade with the First Nations. He found them aggressive though, and ended up shooting one with his musket. By 1800 the Spanish had left Nootka, and the British had taken control of the area. Trading posts on the West Coast of Vancouver Island were closed and the main trading area on the Island became ‘Newitty’ (which was actually at Shushartie Bay). It continued to play a prominent role in trade on the island for thirty years. These First Nations faced many threats, owing to their preferred trading relationship with the British. In order to keep this position they had to regularly face challenges from their Northern neighbours, including First Nations from Bella Bella (Heiltsuk) and Kitkatla (Tsimshian). In the 1820s traders noted that the population of the area significantly declined. 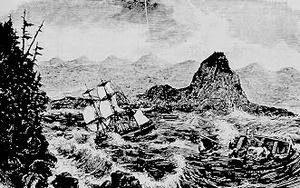 In 1850 the “Nahwitti Incident” resulted in the Royal Navy destroying two of the First Nation’s villages, in retaliation for the suspected murder of three Hudsons’ Bay Company deserters (see more at: http://undiscoveredcoast.blogspot.ca/2013/10/the-tragedy-of-nahwitti-incident.html). Many of the Cape Scott First Nations had amalgamated with the Nawhitti by the mid-1850s. Around this time, when Fort Rupert was established, a census of the area noted that the Nahwitti had six villages, over 3000 members, and over 700 men of fighting age. In the early 1900s Roderick Haig-Brown fished the Nahwitti River for steelhead, and it became a part of his folklore tales of fishing on Vancouver Island. Today we have local place references which keep this heritage alive in the names of the Nahwitti Lake, Nahwitti River, Nahwitti Bar, and the Nahwitti Cone. I originally had in this article some references to the Tonquin, as per below. A reader raised a question about the location of these events and I have researched the item in a bit more detail. A number of the historical references have this incident being triggered by a disagreement with the 'Newity' Indians and reference events that took place at the Newitty village. There does seem to be general historical agreement though, that these events took place on the West Coast of Vancouver Island, potentially in the area of Nootka. Maybe there is a Nuu-chah-nulth village of the same name as the North Island Nahwitti people? In 1811 the Vancouver Island First Nations captured an American trading vessel, the Tonquin. Some reports say that the skirmish started when the vessel was anchored off the village of 'Newitty' and some say that a number of 'Newitty' people were kept on board the ship against their will. The Tonquin appears to have been in Nuu-Chah-Nulth territory when the vessel was attached by the local Indigenous peoples. By evening only a couple American survivors remained. Scared, they slipped away from the boat in a dingy under the cover of darkness. The next day the First Nations returned. In the course of raiding the vessel either the First Nations, or one of the Tonquin crew members (reports differ) detonated the ship’s magazine, killing possibly hundreds of Indigenous people and destroying the ship. The First Nations hunted down the crew and killed all but one translator, who was kept as a slave for a number of years before he managed to escape.